"The exhibition will open the day before what would have been the singer's 60th birthday"
Sounds like this would also be an excellent documentary. The Evening Standard must have corrected it because it just says this-it doesn't give the run date, though. Michael Jackson: On The Wall will open on August 28, a day before what would have been the singer’s 60th birthday. It is curated by the gallery’s director, Nicholas Cullinan, and includes essays from writers Zadie Smith and Margo Jefferson. Mr Cullinan said the exhibition takes an “entirely new and quite radical approach” by exploring the cultural impact of a unique figure through contemporary art. Last edited by Paris78; 21-09-2017 at 03:05 PM. Was just reading up on David LaChapell. Whoa!! Serious stuff. Too bad he and Michael never met. Oh my days this quote from David LaChapell! WOW. Love it! “We persecuted him. Every person who ever bought a tabloid or watched the news, we all contributed to his death by taking in that form of gossip… Madonna has been torn down. Michael Jordan has been torn down. Michael Jackson was destroyed. Like no other person in our times. You have to remember that Michael Jackson was innocent. He was proved innocent in our courts. If you read the transcripts of the trial it is insanity, it should never have gone to court. We spent tens of millions of dollars to prosecute him when we don’t have money for schools in California,” LaChapelle tells Nowness in 2010. 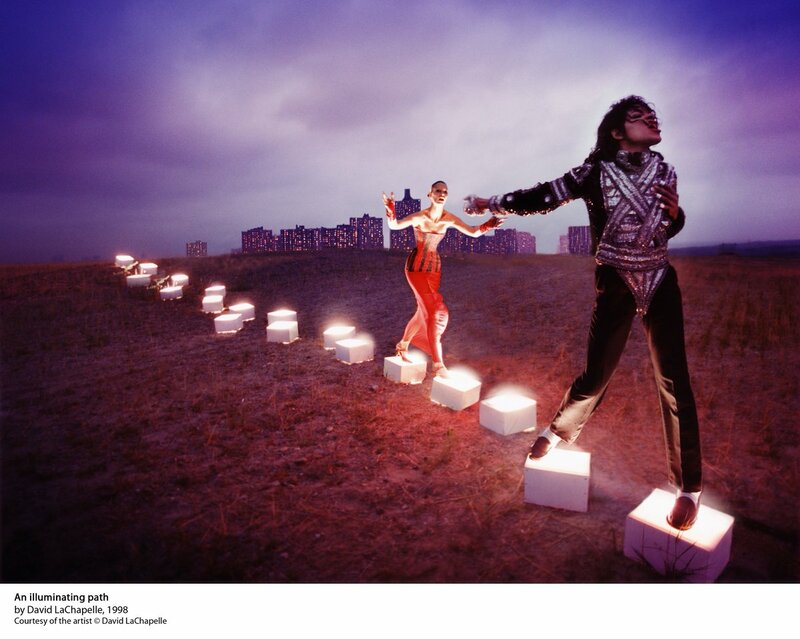 Wishing to balance the overtly negative portrayal of Jackson in the media, LaChapelle decides to portray the singer as a martyr: “I believe Michael in a sense is an American martyr. Martyrs are persecuted and Michael was persecuted. Michael was innocent and martyrs are innocent. If you go on YouTube and watch interviews with Michael, you don’t see a crack in the facade. There’s this purity and this innocence that continued. If it had been an act, he couldn’t have kept it up. If you watch his concerts from Budapest and compare it to a Madonna concert of today, you’ll see such uplifting beauty and a message that you won’t see in any other artist of our time,” he explains to WWD in 2010. Yes, he was spot on, painfully so. How Michael was treated by the tabloids, by our so called law enforcement, and even by people he thought were on "his side" was inhumane and despicable. No matter how many times they tried to bring him, and keep him down, he managed to rise above. I don't know how he did it without going postal. I just checked him out on wiki and look at the chain he's wearing in the picture! I like this dude a lot! Wow!!! Good eye you have!!! It is too bad that they never collaborated-I also think it's interesting that he ran away from home at 15 and became a busboy at Studio 54. That wold have put him there when Michael was about 20/21 when he was still going there, celebrating his birthday, etc. Really interesting-guess that might be where he met Warhol, etc. I also remember seeing pictures of Dr. Klein's auction when he had to declare bankruptcy-and he had a large print of the LaChapell photo of Jesus holding Michael hanging in his house.